A blog reader is accusing celebrity blogger, Linda Ikeji of lying to Nigerians about being married, and buying a Bentley Mulsanne for her son, Jayce. According to the lady who wants to remain anonymous, Linda Ikeji is not married to her baby daddy, Delta big boy, Sholaye Jeremi, as she claimed, in fact, his family was allegedly mad at him when they learnt she was pregnant for him. Anonymous also claims Linda was always frequent at Jeremi's place when he was living in Lekki, that it almost became annoying as she visited one time without prior notice and Jeremi sent her away. Anonymous also claims Linda Ikeji might be the "poorest" woman in Jeremi's life, as he is involved with two other very rich women, and one of them is a model. Anonymous is also alleging that the over N120 million Bentley Mulsanne she claims she bought for her son Jayce, was purchased by Jeremi. "Hello, please keep me anonymous. 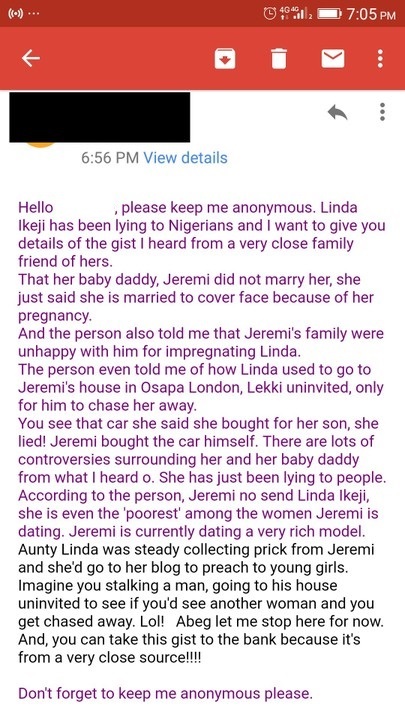 Linda Ikeji has been lying to Nigerians and I want to give you details of the gist I heard from a very close family friend of hers. And the person also told me that Jeremi's family were unhappy with him for impregnating Linda. The person even told me of how Linda used to go to Jeremi's house in Osapa London, Lekki uninvited, only for him to chase her away. You see that car she said she bought for her son, she lied! Jeremi bought the car himself. There are lots of controversies surrounding her and her baby daddy from what I heard o. She has just been lying to people. According to the person, Jeremi no send Linda Ikeji, she is even the 'poorest' among the women Jeremi is dating. Jeremi is currently dating a very rich model. Aunty Linda was steady collecting prick from Jeremi and she'd go to her blog to preach to young girls. Imagine you stalking a man, going to his house uninvited to see if you'd see another woman and you get chased away. Lol! Abeg let me stop here for now. And, you can take this gist to the bank because it's from a very close source!!!! "